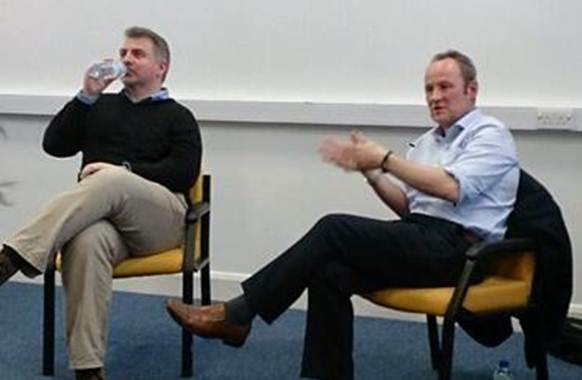 A couple of weeks back I hosted a Q&A session at The University of Northampton with ITV News’s Head of Digital, the redoubtable Jason Mills. That reflects my own view. Last year, when I was applying for jobs lecturing in journalism, I spent a lot of time telling anyone who would listen that there’s never been a better time to be a journalist. The entire industry is being remade, rule-books ripped up, received wisdom over-turned. People throughout the media are comparing the digital revolution to the invention of the printing press. New companies are being set up, experiments are being carried out, reputations are being made. Of course, things don’t look so rosy if you’re a middle-aged hack on a newspaper. Innovation and disruption are exciting things to do, but not so comfortable to have done to you. As George Brock from City University has outlined in his relentlessly optimistic “Out of Print: Newspapers, journalism and the Business of News“, it’s the people who repeatedly throw the spaghetti against the wall who are going to create the new publishing platforms and maybe some of them will strike oil too. For those dazzled by the pace of change, institutionally or personally unable to react, it will be all too easy to be over-taken by the pace of change. But I think there’s reason to be optimistic. For some time it’s been fashionable to predict the rise of the individual journalistic brand. The reporter or columnist who becomes bigger than the institution they work for. Recent moves in the United States suggest that time has arrived and that journalists like Glenn Greenwald, Ezra Klein and David Pogue are now able to command significant value to transfer to digital start-ups, bringing their cachet with them. The Pew Research Center has published some new data looking at the size of the digital native news market. It looks encouraging, these are significant editorial departments. And as Buzzfeed’s Jonah Peretti has made clear, these are organisations with significant editorial ambitions which stretch far beyond 28 Devastating Truths about Adulthood Nobody Ever Tells You. It’s a fascinating time. Both to be a journalist and to be a journalism teacher. @jasonmillsitv @Matt_Walsh @Journalism_UoN Just don't expect to make much money! Still that is another story….